Hello guys. 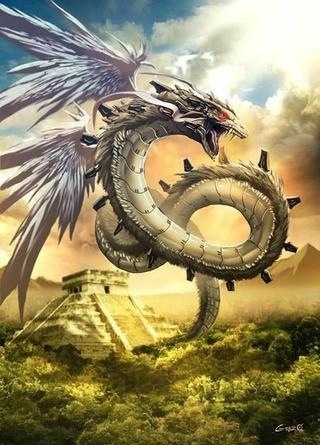 I decided to make a guild about Kukulkan, Serpent of the Nine Winds. Kukulkan is ranged mage, pusher, with good both, single target and area damage. Kukulkan pretty much depends on his abilities. My biggest disappointment was when i found out that he has so slow movement speed and he is something like god of the winds. Like every other mage he has slow attack speed but good damage. Some may say that Kukulkan don't depend on his abilities but i think he does because his abilities are great and his attack speed is low and you will most likely die without using them. So in this guide i created 2 builds. One for damage dealing and other for tanking. Kukulkan is more damage dealer but what the hell. 15% cooldown reduction + 25% on Chronos's Pendant gives you 40% which is max. Or simply to evade enemies abilities like Hades's ultimate. Kukulkan is skill based god. He has great skills good for single target damage and area damage. Kukulkan in the arena can be very good if you play it good. You can get in and out of battles with your Slipstream, you can do good damage to enemies with your Zephyr because almost nobody build up his defenses in arena, Spirit of the Nine Winds can hit running enemies or when they get close to each other. Your Whirlwind can prevent enemy minions from entering your portal. You can do so much more. Just never go alone because everyone have high attack power so you will be very squishy. I advice you to go in duo lane with some guardian, especially if you are using damage dealer build. You can try mid lane too because of your high abilities damage. If you are using tank build you could try solo lane and see how it goes, but you can be support in duo lane too. Make sure to put wards wherever you go because if enemy ganks you, you're most likely done. You can quickly clear enemy minion waves with your Whirlwind and provide your minions to attack enemy tower or phoenix. So joust is where you can be carry in your team. Your Whirlwind has radius for almost half of the lane. Same like in conquest, watch out for ganking. You should know when to retreat too. If watch out for gankers and retreat on time you will level up faster then others and become unstopable. Same is with siege. just you have to be in team with somebody so i suggest some guardian. So there are few combos with Kukulkan which will kill enemies or force them to retreat if they have a lot of health and good protection. First you use Zephyr so you deal some big damage to enemy and slow him down, next you use Whirlwind and put DoT on him. While tornado is dealing him damage you use basic attacks. So now his health will be very low (if he even survives). He will try to flee and then, when he turns his back, you finish him with his ultimate. You could just use your Slipstream and then catch up with him and finish him off with basic attack or with Zephyr but that probably won't work out very well because if he survives that combo he most likely has good defenses and health and that won't succed. This combo is very good against other mages. They will move left and right and attack you. So you use first Slipstream to speed yourself up and you will be harder target to hit. Next use Whirlwind To give him some DoT and to limit his radius of movement. After that you just finish him with Zephyr. For every other combo try to experiment. You may find out some useful things. Kukulkan can be teamed up with many gods, mostly because of 2 builds. I'll just talk about few of them. If you're using build 1 go with guardian, if you are using build 2 go with assasin or hunter. Kukulkan is great god, based on his abilities. I definitly suggest you to buy him and learn to play with him. When you learn to play, you will make your enemies go fully mad, and your allies admired. I tried to mention everything important in this guide and make it as simple as possible. Comment what do you think! You may want to add book of thoth to the build in place of another item, this is one of the best items available for Kukulkan and many people tend to build it as their first completed item. Also you could consider adding a situational item list too as there are other very useful items for Kuk, such as Gem of isolation which adds a 25% slow to your damaging abilities making it very difficult for those who get caught in your tornadoes when their escape is on cd. 90727 JoeAnar You may want to add [[book of thoth]] to the build in place of another item, this is one of the best items available for Kukulkan and many people tend to build it as their first completed item. Also you could consider adding a situational item list too as there are other very useful items for Kuk, such as Gem of isolation which adds a 25% slow to your damaging abilities making it very difficult for those who get caught in your tornadoes when their escape is on cd.